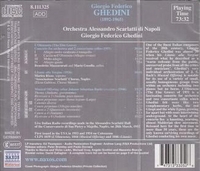 CRITIC REVIEW: "One of the finest Italian composers of the 20th century, Giorgio Federico Ghedini was almost 35 when his Litanie alla Vergine received what he described as a ‘warm welcome from the public, unreserved praise from all the critics and musicians’. Ghedini’s very individual orchestration of J. S. Bach’s Musical Offering is notable for its use of a variety of small, usually homogeneous groups from within an orchestra including two pianos but no horns. L’Olmeneta (The Elm Grove) of 1951 is a fascinating concerto for orchestra and two concertante cellos which Ghedini felt were like two complementary herbs, the red Glaspi and the white Egusa, growing far apart but with roots intertwining underground. At the heart of the concerto lies a haunting, yearning, almost Mahlerian slow movement. Reissued here for the first time in more than 50 years, these are the only known surviving recordings of Ghedini conducting his own music."